(a) When adding master keys and sub-keys (additional registration). 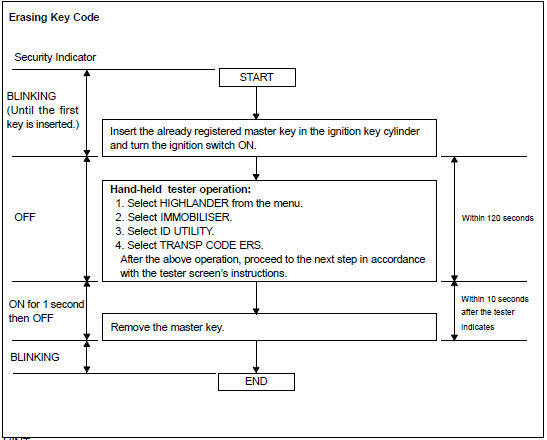 Register the key code (immobilizer code) in the transponder key ECU. (b) When replacing the transponder key ECU (new registration). Register the ECU COMMUNICATION ID between the ECM and the transponder key ECU. (c) When replacing the ECM. (a) When an ignition key is inserted into the ignition cylinder, the key code (immobilizer code) registration is automatic. In this mode, a maximum of 4 key codes for 3 master keys and 1 sub-key can be registered. Any order of registration for the master keys and sub-keys is fine because the transponder key ECU can distinguish between different types of keys. When a new transponder key ECU is installed, key codes (immobilizer codes) must be registered with ignition keys. New transponder key ECUs are automatically set to automatic key code registration mode. When no key is inserted in the ignition key cylinder in automatic key code registration mode, the security indicator remains on. When the immobilizer system is operating normally and the key is pulled out, the security indicator blinks continuously. If the key code registration has failed in automatic key code registration mode, code 2-1 will be output from the security indicator. Trying to re-register an already registered key will cause code 2-2 to be output when the key is inserted. If the number of registered key codes exceeds the limit, code 2-3 will be output from the security indicator. The output details are shown below. 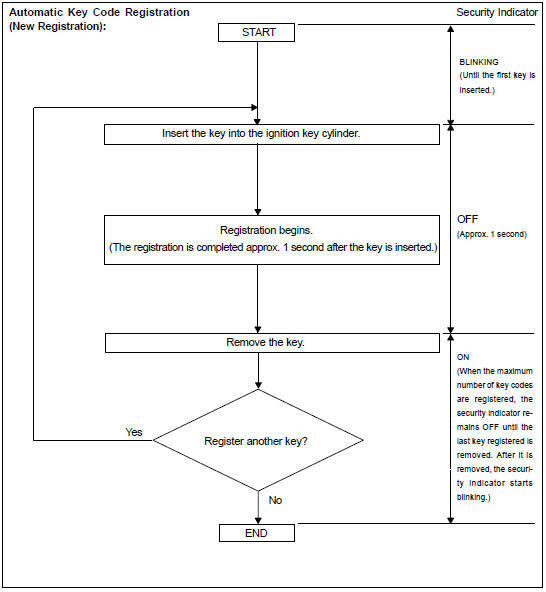 (b) Finish the automatic key code registration mode. 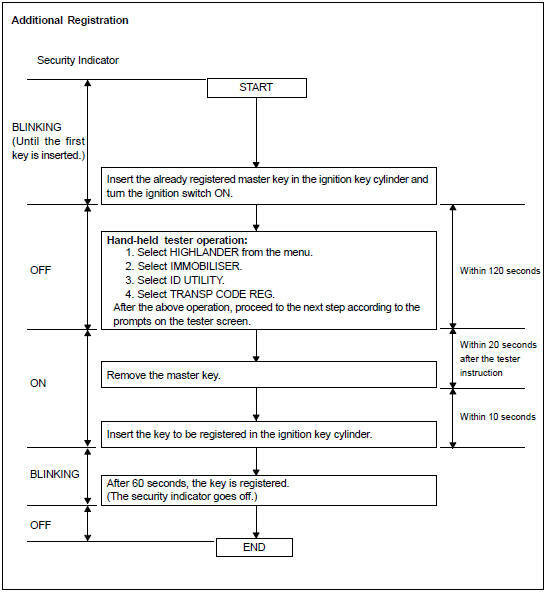 The automatic key code registration mode can be forced to end when at least 1 key code (immobiliser code) for the master key has been registered. Turn the ignition switch ON and OFF 5 times within 10 seconds using the already registered master key. (a) Register an additional key by using the hand-held tester. A maximum of 5 master key codes and 3 sub-key codes can be registered. Registration mode will end if each step is not completed within the specified time. NOTICE: When the ignition key cylinder has been replaced, locking and unlocking doors is possible with the new master key's transmitter module (taken from the original master key). However, the new master key will not be able to lock and unlock doors through the door key cylinder. Keep the original master key. If the new master key's transmitter module's battery fails, the original master key can be used to lock and unlock doors through the door key cylinder. A brief outline of procedures for key code registration is shown on the previous page. For more detailed information, please refer to the hand-held tester screen's instructions. If the key code registration has failed in automatic key code registration mode, code 2-1 will be output from the security indicator. Trying to re-register an already registered key will cause code 2-2 to be output when the key is inserted. 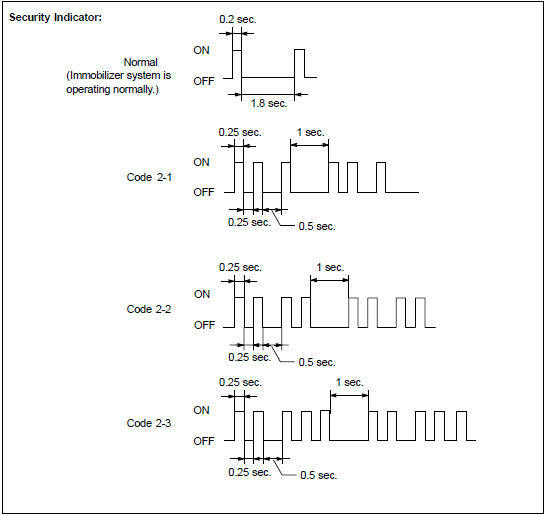 If the number of registered key codes exceeds the limit, code 2-3 will be output from the security indicator. The output details are shown in step 2 (new registration). (a) Erase key codes using the hand-held tester. All key codes are erased except for the master key, which is used for erasing the key codes. In order to use a key whose code has been erased, a new key code must be registered. Registration will be cancelled if each step is not completed within the specified time. A brief outline of procedures for key code registration is shown on this page. For more detailed information, please refer to the hand-held tester screen's instructions. The ECU communication ID should be registered when the transponder key ECU and/or the ECM is replaced in order to match the ECM COMMUNICATION ID. The engine cannot be started unless the ECM COMMUNICATION ID matches. (a) Register the ECU communication ID. Turn the ignition switch ON (do not start the engine) and leave it as is for 30 minutes. Turn the ignition switch OFF and disconnect terminals TC and CG.